“Your why” is “Your” why. It is not the dream of someone else or their passion. You have to narrow down “your why” in order to be able to set the goals to help you achieve the success that you want. Success is different for all of us. We often get caught in the Hollywood idea that it is about making big money. But that is not what it is about. Success is based on “your why”. 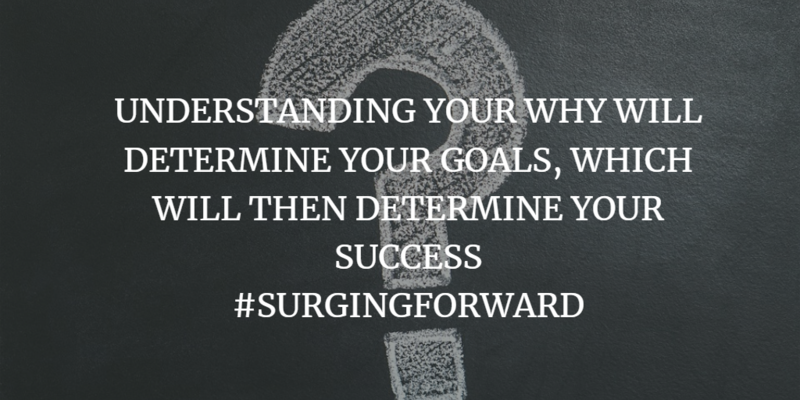 Define “Your” why and that will help you to achieve your success. Success does not happen by accident, with the exception of the rare cases of an inheritance that you did not know about. But even then, if you don’t have a why and you receive a lot of money you will more than likely just waste it. Life is not like the video games or the movies where we can just live life haphazardly and hope for the best, then die and get another chance. In games we can keep playing over and over until we get it right. In real life there is no do over or rewind. If you make a bad choice it can stick with you forever. A bad choice when you are young may hinder you, but it does not mean you can’t become successful. It just may place limitations and cause you to rethink “your why”. That is why we need to be very conscious of the people that we hang around with. If you hang around negative people all the time, then you are going to become one of them and that becomes your why. Take advantage of the resources around you that can help you with “your why”. Hopefully by listening to this podcast it can help you to simply take a moment to stop and think about “your why”. We have all been created with special skills. But we often allow other people to define who we are and what they think is best for us to do. By honing in on our special skills it will enable us to stand out from the crowd instead of just being a number. By knowing “your why” it will help you to focus on what needs to be done to achieve success. When you start, “your why” can be small but then it builds over time. Be flexible, over time “your whys” can change so that you can Keep Surging Forward. Once you have determined this; then you can start taking steps to achieving your goal. 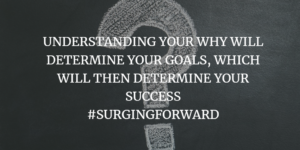 If you would like to set up a coaching session contact me at dave@surgingforward.com If you enjoy this podcast, please feel free to leave a comment below, share with a friend and also visit our Facebook page at https://www.facebook.com/SurgingForward/ We also have a You Tube page where you can watch the actual podcast; visit us at https://www.youtube.com/user/surgingforward Looking to network and get personal training visit us and like us on facebook click here Connect with me on Linkedin Follow us on twitter click here Follow us on Instagram. Contractor and Tradesman Courses to help you Get and Retain your Tradesman License; visit our website at www.surgingforward.com ________________.